During and after a psychedelic experience, trippers often say that they’ve learned or discovered something through the experience — for many, that’s why they took it in the first place. When I talk about this to non-users, however, there’s often a reluctance to accept that this is possible. How could a drug teach you something? Weren’t they just hallucinations? If you did learn something, couldn’t you have learned it at least as easily sober? Often, the things people learn are features of their surroundings which, some might argue, could have been observed without having taken drugs. For example, negative perceptions of the places where the trip took place. One respondent said that Wasaga Beach “…felt like an episode of the Jersey Shore… it was douche-con. … every time I think about it, it makes me laugh, it just seems like a hilarious place.” Another (a white, male, 17 year old) talked about tripping at Canada’s Wonderland and said how the greed and gluttony of the place really bothered him. “It made me more aware of how everyone was trying to sell me something, literally everywhere I looked. … gluttonous entitlement… morbidly obese children stuffing their face with doughnuts. It led to a bad experience, and, in all honesty, I do not want to go back to Wonderland.” It’s not like the things my respondents were noticing about Wasaga and Wonderland were produced by the drugs they’d taken, and some people might develop similar impressions of those places without psychedelics. In fact, another of my respondents told me about a great trip had at Wonderland, so taking mushrooms there is neither necessary nor sufficient for developing those negative impressions. However, for my respondent who did that feel that way, the mushrooms seem to have played some sort of role. In cases like these, that role is in blowing up what’s already happening to larger than life proportions. By exaggeration, truth becomes more obvious: motives and relationship dynamics we usually just ignore come to the surface, and the superficial pleasures of places like Wonderland and Wasaga may no longer be sufficient to blind us to their faults, which are now experienced on a much larger scale. Similarly, I’ve had several respondents talk about romantic relationships that they realized were doomed because of a trip: they were together for the wrong reasons to begin with, but until they took psychedelics, they lacked the insight to realise that they don’t actually like each other all that much. First they sobered up, then they broke up. There are some common insights which often occur to people during psychedelic trips. Things like… we are all connected; trees contain recursive geometry; nature is awesome; love, empathy and compassion are very important. When described in writing like this, these things seem obvious, but sometimes experience is necessary to catalyse our understanding. The classic psychedelics simultaneously increase our perception of significance while improving our ability to think both clearly and abstractly, helping us to see what we should have seen all along. Not all insights gained are experienced as good things. Sometimes, self-critical observations become dominant. For instance, you might realize that you’re lazy, filthy, selfish, effluent, unprepared or disrespectful. Some people realise they have a poor diet, get insufficient exercise, have a bad living situation or a weak social support network, etc. These sorts of insights are often on the margins of our consciousness and can be accessed by act of will; the psychedelic seems to cut out the middleman, so to speak, confronting us with our lives and surroundings whether we want to confront them or not. While this may be unpleasant, sometimes it provides just the slap in the face we needed in order to start fixing things. One respondent told me how, during a solo acid trip, it occurred to her that she really knew very little about her friends, having mostly gotten by on superficial details and never having cared to ask many personal questions. Rather than simply sulking or feeling ashamed, she spent the next while making lists of everything she did know about her friends, committing herself to learning more about them in the future. To many people, especially non-users, this probably doesn’t sound like what you’d expect from an acid trip — it sounds more like just a day spent at home thinking about things. But for a lot of people, that’s exactly what an acid trip is. “Tripping” really just means thinking intensely about something, often to the point of absorption. If you follow the standard recommendation for a trip (preparing by eating well, thinking through your current mental state with an eye to anything that may be wrong, ensuring that you have a comfortable place where you can be alone if you choose, but also good, loving friends to communicate with if you want company, and taking time afterward to reflect upon and integrate anything you may have learned), chances are good that you’ll gain valuable insights even if you don’t take a drug: intentionality and contemplation are enough. However, some substances seem to synergize fantastically with this sort of process, and are therefore useful to occasion insights. When an insight comes to us in a visual form, it seems easier to make the leap to saying that it was “because” of the drug, since we associate seeing things with being on drugs. It’s often said, for instance, that Dr Francis Crick discovered the molecular structure of DNA because, after many nights of trying unsuccessfully to work it out, he took LSD and saw a vision of a double helix. * For Crick, attempting to translate an extremely complex mess of numbers into an also complicated shape was clearly made a lot easier by the introduction of a visually stimulating substance. The capacity of psychedelics to play with sensations and perceptions is not limited to the visual field, of course. Darqchild, Dave, Firefly and Four all told me that tripping taught them new ways of understanding the body, providing insight into angles of motion, joints and fluidity, making them better at such things as dancing (Dave), anatomical drawing (Firefly) and martial arts (Four). Darqchild also explained that abstract ideas may be felt physically, making them far more concrete and therefore easier to evaluate and understand. This, I think, is the crux of the matter: that normally we will try to understand things using only our heads, which, singular and rigid, can’t quite wrap around them. On psychedelics, however, our cognition becomes fluid, and we flow over them, experiencing with our totality. Music, emotions and concepts all engage us through many senses at once, and the visual or tactile experience of something can give us an enormous push towards actually understanding it on a very profound level. 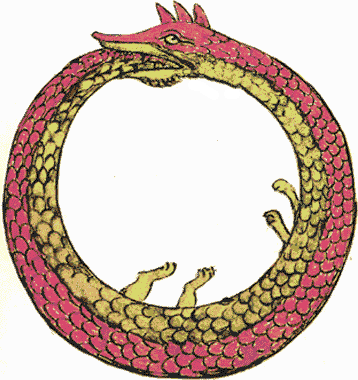 *Interestingly, this is almost exactly the same story as August Kekulé’s discovery of the molecular structure of benzene, except that his vision (of an Ouroboros, a snake eating its own tail) came while simply daydreaming, not on any drug. This supports my point, above, that introspection might lead to insights even sober… but how often do you have visions when you daydream? The advantage of psychedelics is how reliable they are for putting us in that state. I always thought of the pathway of psychedellics as removing the mental barriers and blocks we conciously and sub-consiously put in place throughout our life. These mechanisms help us live within a society. They help us get through life without constanly getting hurt. They’re essentially the code that allows us to keep our guard up and fit in. Without them, we’re non-functionable. We learn a lesson, and up goes a mental barrier or block. Its like a piece of code telling us how the world works, and our place within it. The problem is that these barriers and blocks also affect the way we see the world in ways we might not want them to. A block might have been put up at the age of 7 for the wrong reason, or might be universally applied rather than in a context. Often times, we don’t even know they’re there. You tell someone a secret at age 4 and they tell the whole world and we get made fun of and it hurts. Lesson learnt. And it gets coded in our brain. We ask a girl out and she says no and it hurts. It gets coded. And up goes a block. Society tells us boys act like this, it gets coded. Your parents get angry when you express how you feel. It gets coded. The media gushes about rich people. It gets coded. It goes on and on. Drugs remove many of the blocks and the barriers, essentially “freeing” our mind. Thats why we’re so exposed and child like on many drugs. We say things we “shouldn’t.” We tell our friends how much we love them. We share. We’re honest. We’re caring, gentle, and loving. And so when we see problems or issues or relationships without the blocks and the barriers, it gives us a more true and unbiased perspective. We’re able to question societal norms, stereotypes, and biases. We begin to see people and situations and our place in the world for what they really are, and are able to critically take a different look at who we are, where we are, how we interact with our world, and who we want to be. It also explain why sometimes we change, and sometimes we don’t after a trip. Sometimes we can take the barrier down for good. Other times, after the trip is done, the barriers go back up or are quickly relearnt. So behavior might not change. But even if we can’t remove the block, we can remember the observations and realizations we make on trips, and then after the trip, then we are empowered to make changes. What you’re describing is the radical destabilisation of the cognitive economy. Adding to your analysis, we should note that the cognitive economy is not merely produced out of repression, and it cannot truly be done away with, nor would it be beneficial to do so: we need our cognitive economy intact most of the time. Try taking a shower while peaking on LSD to see what I mean… yes, some of our narrowing of perception is ultimately detrimental and it’s good to learn to do away with that, but far more of it is essential to day to day living. The wonderful thing about psychedelics is they give us a little break from that… for a few hours we can lift our filters and see things in all the ways we usually ignore, and then our filters gradually come back and we’re able to go on with our lives. As much as we may mourn the end of a mushroom trip, feeling that we “just had it,” the mind has its many cycles, and it’s alright to conserve focus. Enlightenment is a thing you have to work towards, but that’s okay: the scenery on the way there is spectacular even without taking drugs. Anyway, I’m sure I’ll do a full article on the concept of the cognitive economy at some point. Subscribe so you won’t miss it! My experience of psychedelics, both first and secondhand, is that they’re quite likely to convince you that you have had a profound insight regardless of whether or not you actually have. LSD in particular mimics the chemical environment and, one might say, ‘narrative structure’ of revelation, which can indeed increase the odds of achieving genuine insight, but the odds are even greater that whatever happens to be passing through your mind will be taken for a profound truth. Having tripped or even having achieved a strong cannabis high may well broaden one’s perspective. These substances introduce stutters and hiccups into our perceptual processes which can make the processes themselves visible, delivering the basic realization that much of what we take for reality, both personally and collectively as a society and sentient race, is a construction of our own minds. Beyond this initiatory revelation, however–what we might call ‘a glimpse of the road’–these substances offer rapidly diminishing returns. Pursuing the sensation of insight they provide is more likely to leave one sitting where the road turns off, or else far out in the weeds, than actually advance one’s understanding. I think the most difficult thing is to maintain a critical/rational thinking and to be enthusiastic and open minded at the same time. It’s easy to lose your “attention” when you are in a path like this. That is why it is very important to leave 3 times the amount of time you think that you need to recover from the previous experience before going to the next. The unfolding of the experience inside you is a tricky business. It needs a lot of reading, LIVING, thinking and remembering. When all the above is achieved you are sure that psychedelics isn’t a waste of time/thought. Otherwise the only thing that will be left in your memory will be these “false epiphanies”. great article and comments, and I was surprised to see that it’s from 2011. Howd I miss it? I am currently exploring a thread asking the question ‘how come that people into psychedelic research seem indifferent to the occultism in our midst–to the point of TABOO. I even emailed Dennis McKenna about this and his short reply was that it was probably because they feel psychedelics are controversial enough. But hey, wait, maybe then one shouldn’t be famous and then be afraid to question stuff like this. I am VERY into psychedelic research and this is why I feel it is VERy important to be aware of the occultism that is in -the-face but noone is mentioning it–like a BIG ELEPHANT in the room. If say Graham Hancock now is quite famous for his TED/Youtube-banned talk about a ‘war on consciousness’, then why is it also not seen the connection between that and the occultism which is most definitely war on consciousness/mind control. MEGA mind control. Surely to show no interest in this is being in a limited hangout where nothing radical has a chance of happening. For if sacred medicine doesn’t help us to see the SYMBOLS and worldview these dark occultists are pushing on the youth via music, and mass media and false flags then what will? Surely this occult phenomena is the SHADOW, BIG style, and we ignore about it at our peril. In fact that is what the dark occultists depend on. So I hope to kive the psychedelic community a kick up the arse and get epopel talking about this extraordinary important issue. Occultism isn’t what you think it is. Did you also see this article, in which I discuss occultism? Or this research paper I did, into a particular brand of occultism? Maybe you should think about Dennis’s answer again and what it signifies. The reason psychedelic researchers aren’t jumping to condemn occultism is because most of them are, themselves, occultists. And also not evil. Because the occult is not what you think it is. Don’t listen to the conspiracy nuts, they’re just scared and confused. I didn’t censor you anywhere. I just removed you as a friend on Facebook. Although I’d appreciate if you stopped posting here. you are a closed minded person.